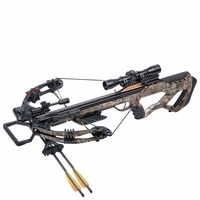 If you�re in the market for an especially narrow crossbow that affords you maximum maneuverability, check out the Crosman crossbows for sale. Models are durable, lightweight, comfortable to use and come with a powerful release. Crosmans also enjoy a unique look. Their minimal bulk and features make them perfect choices for hunting game on the ground. Which of our favorites fits your needs the best? 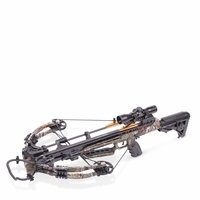 Crosman Mercenary Whisper 390 Crossbow � The Mercenary Whisper 390 sports a surprising camo coloring that immediately speaks to the unique quality of Crosman goods. 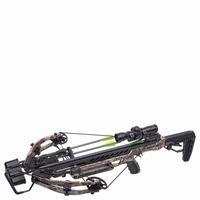 Their crossbows come packed with a surprising number of features for how clean their designs look. 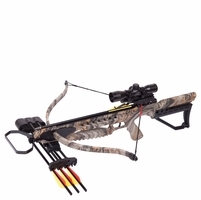 You�ll appreciate the adjustable features, like the tactical stock, which allow you to get the most accurate shot for your size and shooting style. Quad limbs combine their power to create a powerful 390 fps punch. 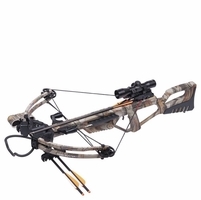 The Sniper is surprisingly lightweight at just 7.5 pounds, and includes several essential safety features, including anti-dry fire and an auto-safety trigger device. 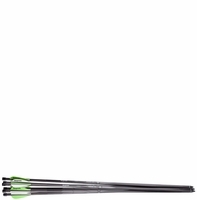 Crosman CenterPoint Tormentor 370 � Lighter than the Sniper by .1 pound, the CenterPoint Tormentor 370 spans just 14 inches from axle to axle. When cocked, that extends to 18 inches, still allowing plenty of room to get around tight spaces. Fiberglass quad limbs support speeds of 370 fps while upgraded trigger protections are sure to keep you safe. The package set ships with a sling, rope cocker, three bolts and a quiver, and a 4x32mm scope. You�ll get everything you need straight out of the box. 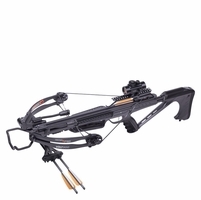 Crosman Spectre 375 Crossbow � Incredibly compact and lightweight, this 7.5 pound selection provides you with speeds up to 375 fps you will love. 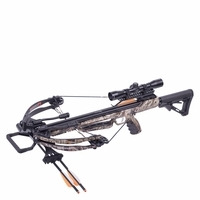 If you�re on the fence about buying a crossbow, the Crosman Centerpoint Crossbows feature high-quality construction we�ve come to trust. 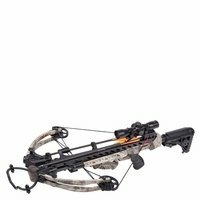 Crosman bows come with generous accessory packages, ranging from quivers and bolts to cocking devices and sites in a range of popular styles. These are well-suited to hunters and shooting enthusiasts who enjoy small spaces and require the ability to quickly get around. Can�t decide? The Outdoors Experience team is comprised of serious shooting enthusiasts. Our sales team isn�t stationed in a foreign call center. They�re hand-picked applicants with enough time behind a bow to give our customers reliable advice. 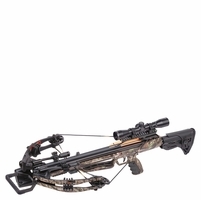 If you ever have a question or need help deciding which Crosman Crossbow is right for you, don�t hesitate to get in touch. We�re here to help before, during or after your order. We can also suggest the best accessories and supplies to use with your new equipment.